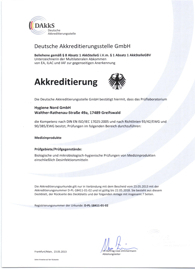 Since 2003, Hygiene Nord GmbH is accredited according to the current DIN EN/ISO IEC 17025 as a testing laboratory, which was reconfirmed by the DAkkS Deutsche Akkreditierungsstelle GmbH (German Accreditation Body) in 2013 and extended in 2015. Thereby the execution of our services is guaranteed by an established certified quality management system. 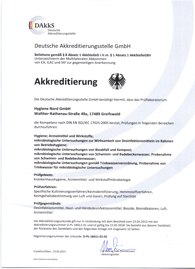 The different inspection procedures are named in the annexure to the certificate of accreditation (German). 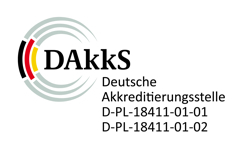 By signing the Multilateral Agreement (MLA) at the European co-operation for accreditation (EA), and the Mutual Recognition Arrangement (MRA) at the International Laboratory Accreditation Cooperation (ILAC), the accreditations given by the DAkkS are approved by all member states. For this reason every testing laboratory accredited by the DAkkS is national, Europe-wide and international approved to be able to conduct specific tests and/or types of tests. For this accredited tests and/or types of tests the laboratory is allowed to use the official DAkkS and ILAC-MRA logo on its test reports. The translation of the certificates and the annexure is now in process, therefore only the German versions are available.